Question: What explains the love affair going on between the Vicar of Christ on earth and the modern executioners of his Mystical Body in the media? The Rolling Stone magazine cover, Time magazine’s ‘Person of the Year”, the Advocate’s glowing praise, and now CNN Money (Fortune) is listing the Holy Father as the “Greatest Leader” in the world today—edging out frontrunners Angela Merkel, Warren Buffet and Bill Clinton. Meanwhile Pope Benedict XVI and even Pope John Paul II are vilified by the same media as intransigent traditionalists, personally responsible for the spread of AIDS and the sexual abuse of children by priests all over the world. In dramatic fashion, for example, PBS Frontline recently took it upon itself to highlight this contrast between Francis and his “evil predecessors” in the deeply disturbing documentary Secrets of the Vatican (viewer discretion strongly advised). For the radically leftist PBS, Pope Francis emerges as a kind of redeemer of the Church and all her works and pomps. This writer does not blame Francis for this bizarre lionization, of course, but it does seem a wee bit over the top coming from an otherwise Christophobic government-subsidized media outlet. It just seems suspicious that the Successor of St. Peter would be hailed as a Super Pope when the very institution he heads is deserving of only derision and incessant attack. Francis has electrified the church and attracted legions of non-Catholic admirers by energetically setting a new direction. He has refused to occupy the palatial papal apartments, has washed the feet of a female Muslim prisoner, is driven around Rome in a Ford Focus, and famously asked “Who am I to judge?” with regard to the church’s view of gay members. So after 2000 years contra mundum, it is Peter’s “new direction” that is garnering the accolades of a world gone mad—a world no longer capable of distinguishing right from wrong, a world at war with God, a world crushing Christian marriage, eradicating the last vestiges of truth, goodness and beauty while wiping out millions of unborn babies. I’m sorry, I just don’t get it. There must be something else – something we’re missing, which is inspiring worldly hope that our Church is on the verge of an unconditional surrender. 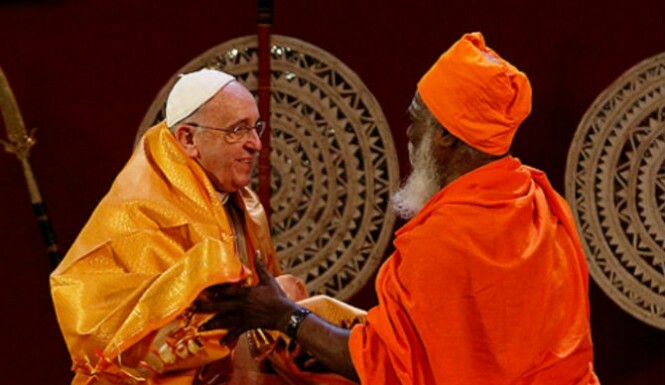 It is no secret that the Holy Father has his supporters in radical organizations such as the Council for a Parliament of the World Religions. He is also regularly praised for his extensive experience in interreligious relations in Argentina. According to the Covenant of Faith blog site, Cardinal Bergoglio was a known supporter of the United Religions Initiative in his diocese for some time. Maria Crespo, an Argentine Catholic and Global Support Coordinator for the URI said in an article last March that she had “worked directly with Bergoglio on interfaith efforts. He hosted a meeting of Crespo’s URI Cooperation Circle, which fosters interfaith cooperation, at the Buenos Aires Metropolitan Cathedral. ‘He is so open and welcoming and humble at the same time,’ she said.” (Laird Harrison, Bay Area Catholics May Find the New Pope a Mixed Bag, KQED News Fix, March 13, 2013. The United Religions Initiative (URI) is an interfaith movement founded in 1995 by William Swing, the bishop of the Episcopal Church’s diocese in the San Francisco Bay Area. It has expanded worldwide, with over 200 chapters – the majority of which are outside the affluent nations of North America, Western Europe, and the Pacific Rim. The URI works closely with the United Nations, and it has received funding from many sources. Among them are wealthy donors (including foundations headed by George Soros and Bill Gates), a Federal agency (the United States Institute of Peace), and organizations (the Rudolf Steiner Foundation and the Lucis Trust World Service Fund) that promote various forms of Theosophy, an anti-Christian, New Age spiritual movement. . .
URI leaders repeatedly equate evangelism to manipulative “proselytizing” and violence. As Bishop Swing has said, “In order for a United Religions to come about and for religions to pursue peace among each other, there will have to be a godly cease-fire, a temporary truce where the absolute exclusive claims of each will be honored, but an agreed-upon neutrality will be exercised in terms of proselytizing, condemning, murdering or dominating. These will not be tolerated in the United Religions zone” (1) – which evidently covers the whole world. Within the Catholic Church, opinion about the URI is divided. Rome stands firm against it, but some theologians, priests, and sisters – and a few members of the hierarchy – actively support it. At Rome in 1996, Bishop Swing met with Cardinal Arinze, head of the Vatican’s Council for Inter-Religious Dialogue. Bishop Swing received a firm rebuff from the Cardinal; he reported that the Cardinal “said that a United Religions would give the appearance of syncretism and it would water down our need to evangelize. It would force authentic religions to be on an equal footing with spurious religions.” Archbishop Michael Fitzgerald, who works under Cardinal Arinze, pointedly ignored Bishop Swing’s invitation to attend the 1997 URI summit conference. Some Catholics, however, are not following Cardinal Arinze’s lead. Paul Evaristo Cardinal Arns, the recently retired Archbishop of São Paulo, Brazil, is claimed by the URI as a “strong supporter,” and Archbishop Anthony Pantin of Trinidad is forming a URI support group in his country. Fr. Gerard O’Rourke, director of ecumenical affairs for the Catholic Archdiocese of San Francisco, has been an enthusiast for the URI from its beginning, serving on its Board of Directors. He took part in its 1995 interfaith service which announced the URI to the public. Other Catholic URI supporters include Fr. John LoSchiavo, S.J., Chancellor of the Jesuit-run University of San Francisco (and a member of the URI Board), and Fr. Luis Dolan and Sister Joan Kirby (associated with the Temple of Understanding). Theologians supporting the URI include Paul Knitter, senior editor of Orbis Books and professor at Xavier University, and Hans Küng. If Francis is still a “friend and supporter of URI” this could shed some light on the media’s optimism that a papal declaration of a doctrinal and moral ceasefire is imminent. It would also suggest that when Pope Francis reprimands “reactionary, self-absorbed neo-Pelagians” he is, in fact, not referring merely to Latin Mass-loving traditionalists (a small and comparatively insignificant group), but rather to all those who insist on rigid fidelity to the doctrines of the Catholic Church. This could include EWTN, Catholic Answers, Opus Dei and any number of conservative, pro-family, pro-life organizations whose dogmatic belief that Christ founded only one true church — the Catholic Church — would be regarded as divisive and counterproductive. Protecting the environment, refusing to “judge”, tearing down the old Catholic bastions of Tradition, not being “obsessed” with the life issues, showing limitless “compassion” to dissenters from the Church’s moral teachings—these are elements the URI would naturally employ to bring about the “religious ceasefire” so key to their utopian vision, what some have called a new world order. As we prepare for Holy Week, let us pray that Pope Francis has abandoned Cardinal Bergoglio’s support for the URI. And even if this proves not to be so, let us remember that Holy Week commemorates those terrifying hours when our fathers and mothers in the Faith witnessed the Messiah’s brutal execution, Peter’s denials of Christ, Judas’ betrayal of Him, and all of the first bishops save one cowering in fear during His passion.